Probably the easiest banana muffin recipe I've ever made. They're great if you have a sweet tooth, if not, I suggest cutting the sugar in half, and to make a slightly healthier version use spelt flour and oats in place of the white flour. Banana muffins are a very easy muffin for vegans to make because the banana can act as a binder and provide moisture instead of eggs. So you don't needs eggs or even egg-replacer! 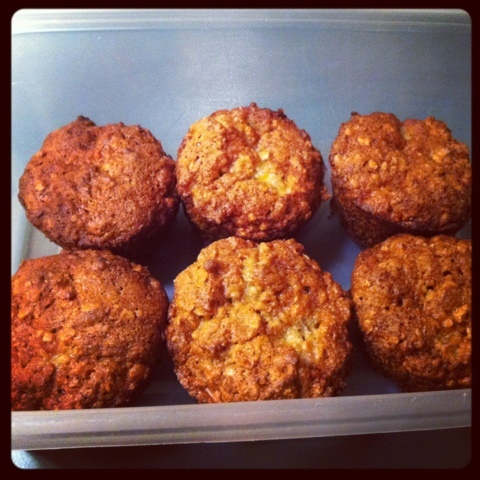 Give this easy-peasy vegan banana nut muffin recipe a whirl and leave a comment to let us know what you think! In a large bowl, mash the bananas with a fork till soft. Add the oil or vegan margarine and sugar and cream together. In a separate bowl, combine together the flour, salt, and baking soda. Combine with the banana mixture, stirring gently just to combine. Grease or line a muffin pan, and fill each muffin about 2/3 full with batter. Bake for about 25 minutes, or until a toothpick inserted into a muffin comes out clean.